LXXII, 424 p., 17,4 x 24,4 cm. Edited, introduced and translated into the Spanish by Augusto Sarmiento. Francisco de Vitoria, who was interested in all questions concerning human life, found in theology the key to giving answers whose validity has not declined over time. This feature, clearly marked in the ›Relectiones‹, also holds for ›De actibus humanis‹. This hitherto unpublished work is a commentary on the nature of human behavior, which mainly focuses on morality as the ontological reality underlying human acts, disposed as they are (or not) towards the ultimate end. The commentary, in spite of being academic, stands out due to its liveliness and practical sense, as well as its unaffected, down-to-earth style. 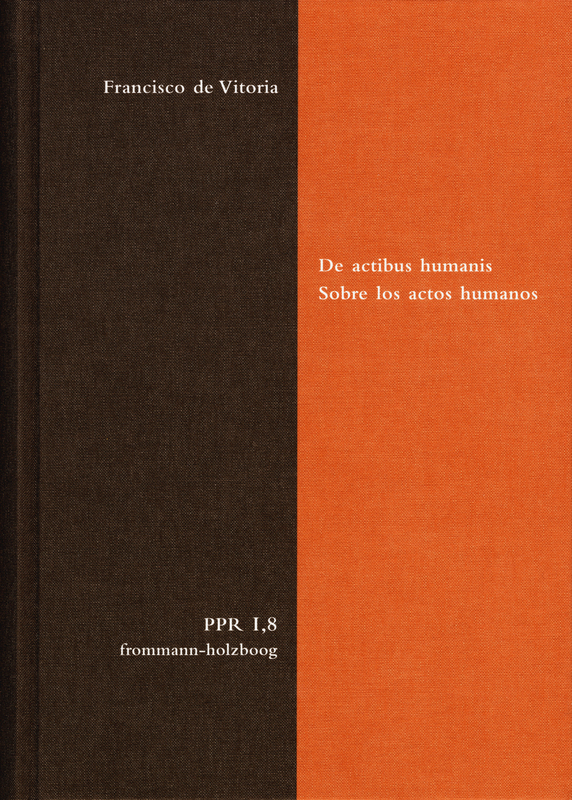 This very first edition of the ›De actibus humanis‹ is published together with an extensive introductory study and a Spanish translation. Francisco de Vitoria, al que le interesan todas las cuestiones que afectan al existir humano, encuentra en la Teología la luz necesaria para dar las respuestas, cuya vigencia no ha decaído con el paso de los tiempos. Esta característica, muy clara en sus ›Relecciones‹, se advierte también en el ›De actibus humanis‹. Un comentario hasta ahora inédito sobre la naturaleza del obrar moral recto, centrado sobre todo en la moralidad como la realidad ontológica de los actos humanos, ordenados o desordenados libremente al fin último. Es académico, pero destaca sobre todo por la viveza y el sentido práctico, pegado a la vida. Esta primera edición del ›De actibus humanis‹, precedida de una extensa introducción, se presenta junto con la traducción española del texto.